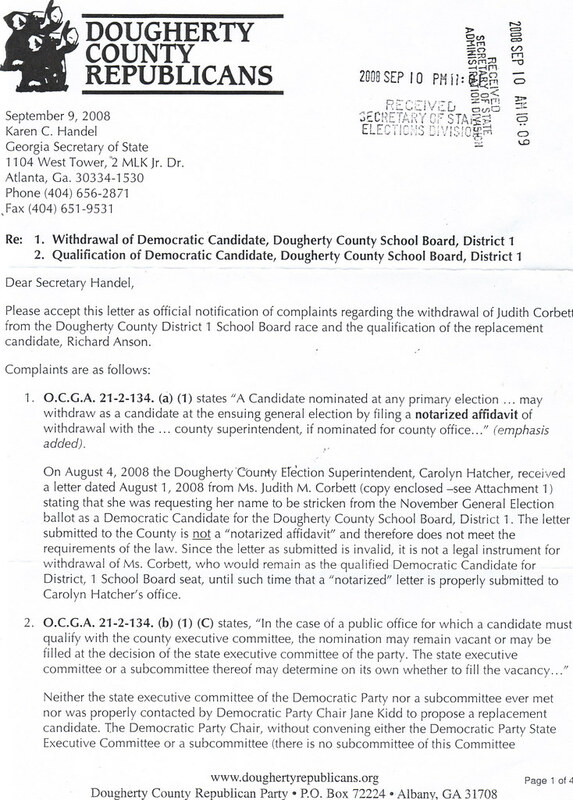 The Albany Herald reports today that the ongoing drama surrounding the manner in which Democrat Richard Anson was placed on the district 1, Dougherty County School Board ballot after the withdrawal of Judith Corbett may end up in court [Source: Albany Herald, "Challenge still unresolved", October 1, 2008]. State Rep. Winfred Dukes (D - Albany), a member of the state Democratic executive committee, told the Albany paper, "I think what you’re going to see is a decision to let this play out in court." The question that a judge may have to answer is whether Judith Corbett properly withdrew from the race after winning the July 15th Democratic primary and whether the state Democratic Party followed the law when naming Richard Anson as the its replacement candidate. 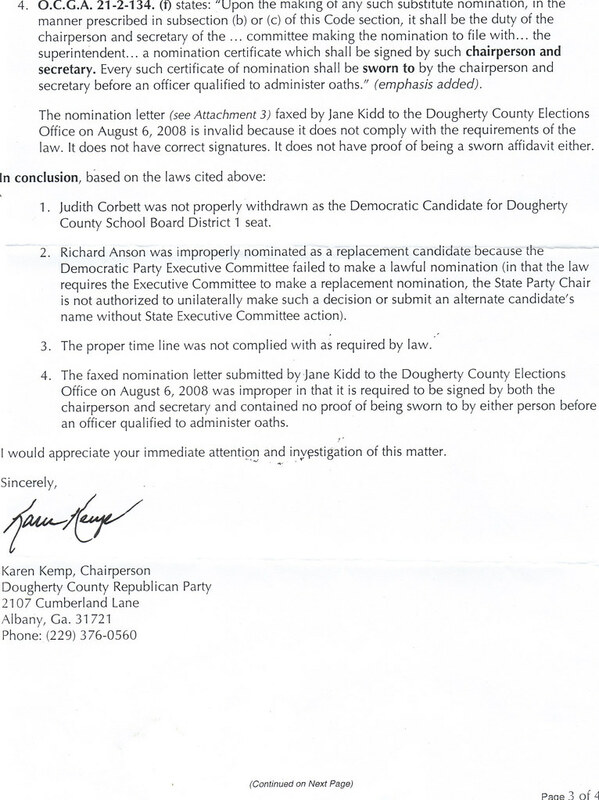 The Dougherty County GOP believes that Judith Corbett should still be on the ballot based on their claim that her withdrawal from the race was not in the form of a notorized affidavit. The county Republican Party also claim that the state's Democrats improperly put Richard Anson on the ballot. 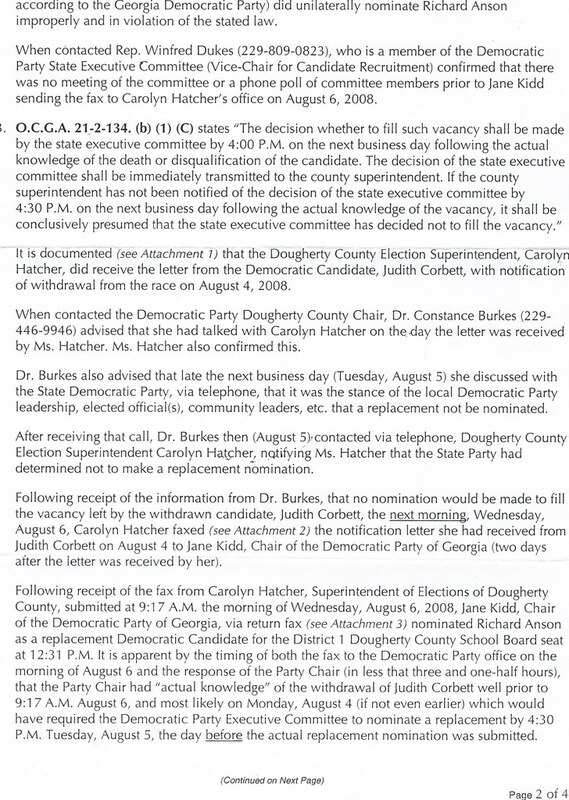 The state Democratic Party, on the other hand, hasn't responded to the complaint saying that they haven’t read it yet [Read the Dougherty County Republican Party's filed complaint with the Secretary of State's office: page 1; page 2; page 3]. "We haven’t read the complaint yet, so we certainly can’t comment on it," [Georgia Democratic Party spokesman Martin]Matheny said. "What we’ve tried to do the whole time is just make sure that voters in Dougherty County have a choice in November." Richard Anson, the Democratic candidate who is the focus of the Republican Party's complaint, echoed the words of Matheny saying, "The only thing that matters to me is that people of Dougherty County have a choice between two board members who have voted on different sides of some major issues." And the Republican candidate for the district 1, Dougherty Couuty School Board seat --David Maschke-- called the whole controversy a "desperate effort by a group of self-appointed power brokers that nominated (Anson) to keep him on the board so that they might be able to maintain their influence and push their personal agendas."